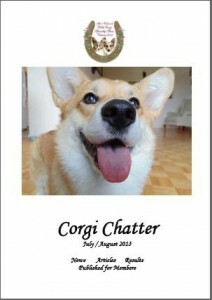 The July-August 2013 edition of the Welsh Corgi Club of Victoria’s bi-monthly newsletter, the Corgi Chatter, has just been sent off to the printers. If you are a current member you can receive it by email in glorious technicolor as a PDF document. The email edition gets sent as soon as we send the file off to the printers, so you get it earlier and in colour! to see the latest edition. This entry was posted in Blog and tagged Chatter by WCCVAdmin. Bookmark the permalink. Welsh Corgi Club of Victoria Inc.
Reg. No A0031698Y Affiliated with the Victorian Canine Association Inc.